The industrial Gowanus neighborhood in Brooklyn, situated on the Gowanus Canal between Park Slope and Carroll Gardens, has been a citywide punchline for years. The canal is so polluted (typhoid, cholera and gonorrhea have all been detected, among many other microbes), the EPA declared it a Superfund site in 2010. 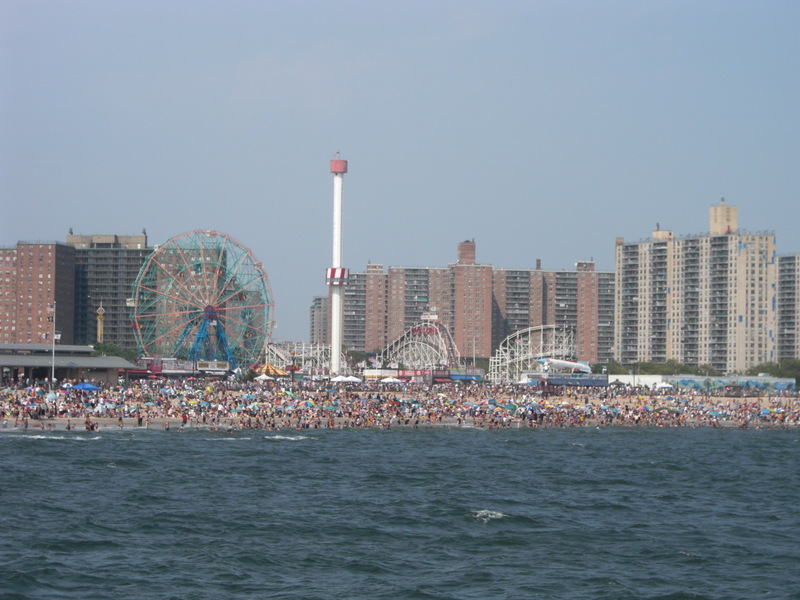 There’s a distinct sour garbage odor that wafts from the oil-slicked water in the summer, when the wind blows just so. An ill-fated whale who accidentally swam into the canal in 2007 was nicknamed “Sludgy” for obvious reasons. 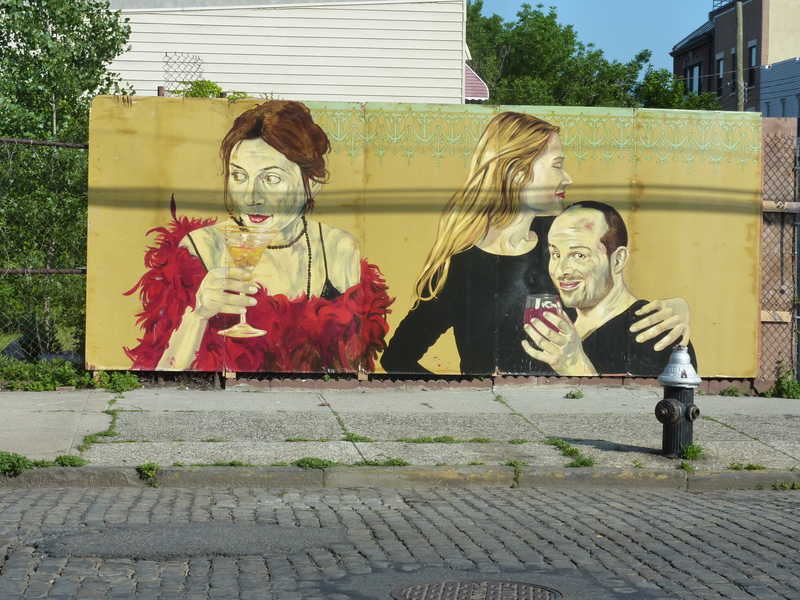 There’s more to Gowanus than a smelly, refuse-filled waterway. 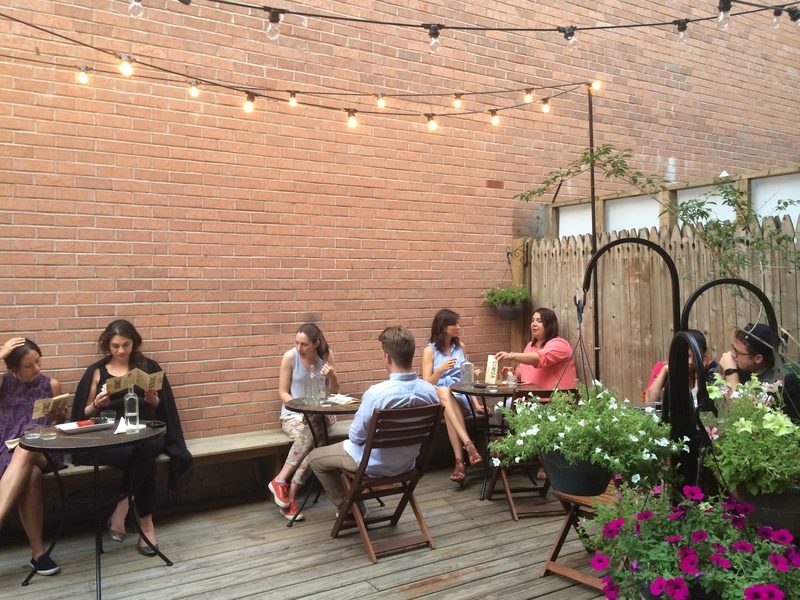 The area has long been home to a prideful Italian-American community–an extension of nearby Carroll Gardens, some of whom still remain, nestled in the few residential streets surrounding the canal. Artists and musicians moved in at the end of the 20th century, seeking low rents and an off-the grid vibe. The enormous “Batcave,” an abandoned power station, was home to squatters, graffiti artists and impromptu punk rock shows up until a year ago. Changes are afoot. The Batcave is being turned into an arts center. And, with a scheduled $500 million cleanup starting soon and a bevy of real estate development, the rest of the neighborhood is quickly transforming into a bit of an adult playground. 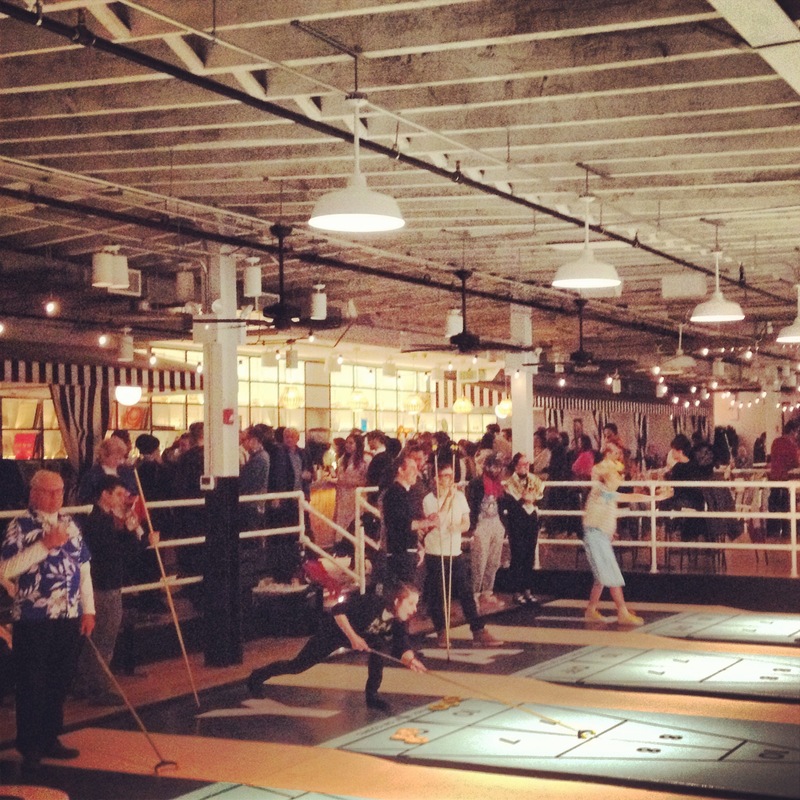 Warehouses are turning into Miami-style shuffleboard palaces and live music venues. The industrial chic Green Building event space, which sits directly adjacent to the canal, is one of the most coveted wedding venues in the borough. 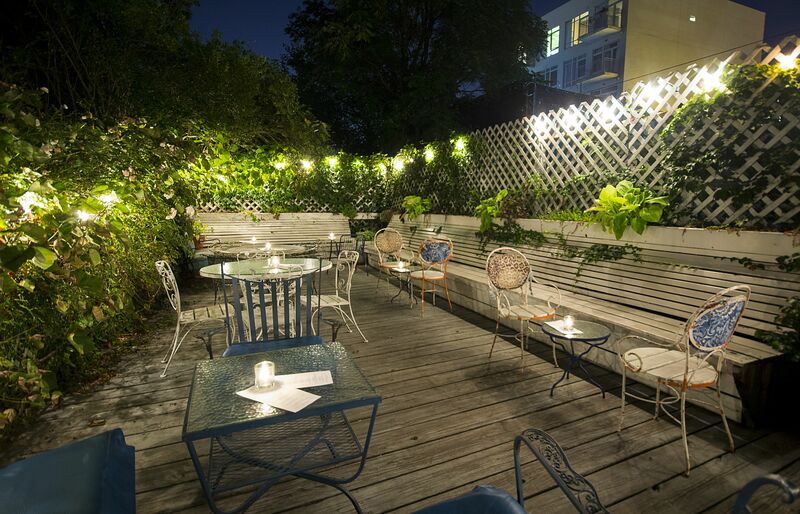 It’s so popular, in fact, that sister space 501 Union opened across the street in 2013. My husband jokes that the expansive South Brooklyn Casket Co. warehouse, situated on prime Union Street, is weeks away from selling its space to a generic speakeasy bar, which will be named… “The South Brooklyn Casket Co.,” complete with cocktails like “The Mahogany.” (Too soon?) 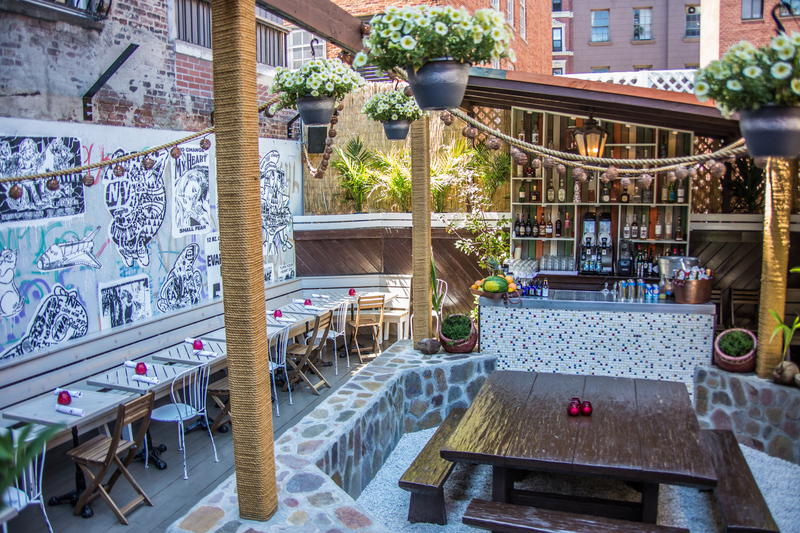 The ‘hood is still a long way away from turning into the next DUMBO, with plenty of curiosities, industry and grit along the quiet, uncrowded streets. Below, a few places to check out in the area. 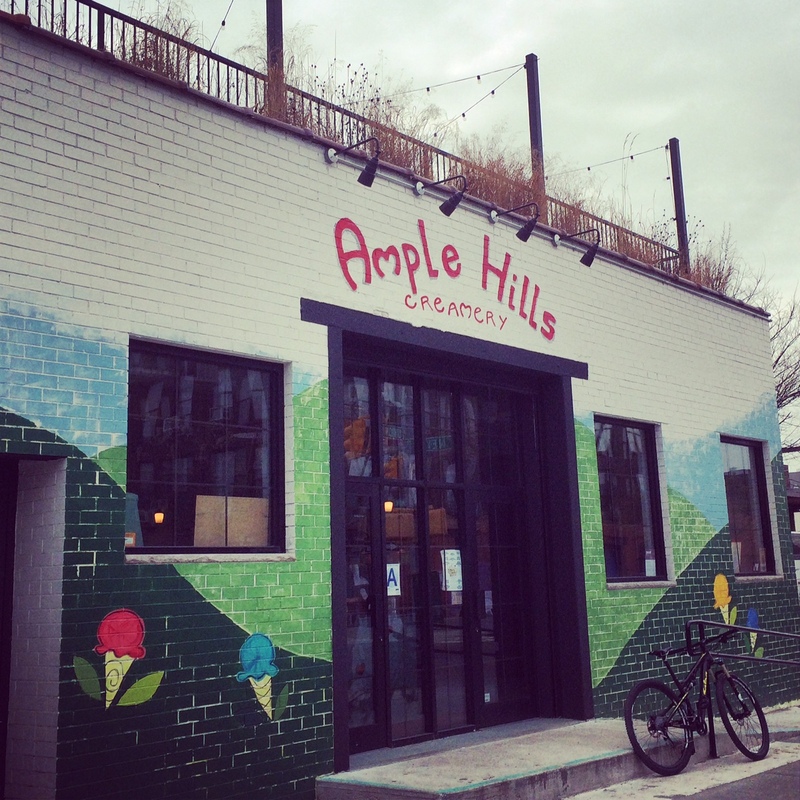 Ample Hills Creamery: Two-story ice cream palace with roof deck. 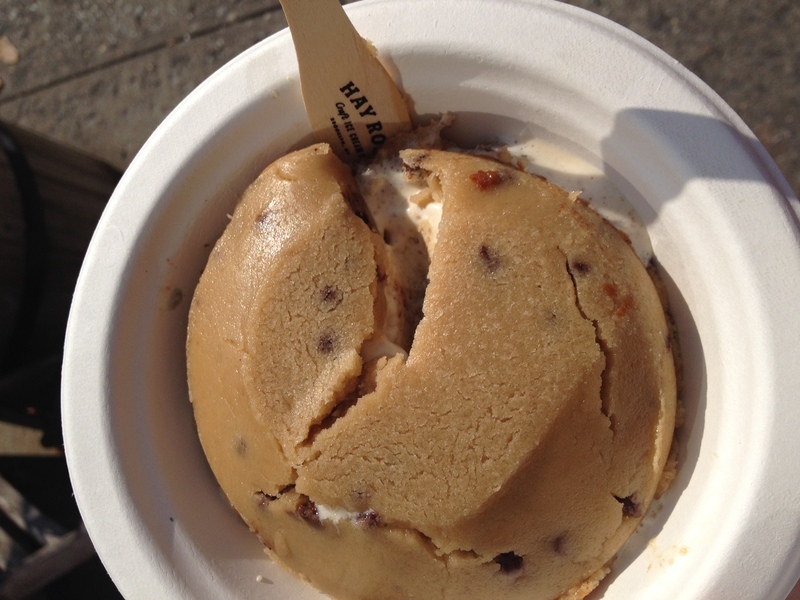 Location-specific “It Came From the Gowanus” ice cream flavor pokes fun at the environs. Runner & Stone: Serious bakery with a full lunch and dinner menu. We sometimes make the trek from our apartment for their buckwheat baguette, fresh out of the oven everyday around 4:30 p.m.
Four & Twenty Blackbirds: Crazy-good world-renowned bakery with a rotating roster of pies. I love any iteration of berry pie and black-bottom oatmeal pie. Dinosaur Bar-B-Que: Syracuse-based BBQ temple that attracts patrons from all over the borough. The baked wings and fried green tomatoes are standouts. Monte’s: Another throwback Italian restaurant whose first iteration opened in 1906. 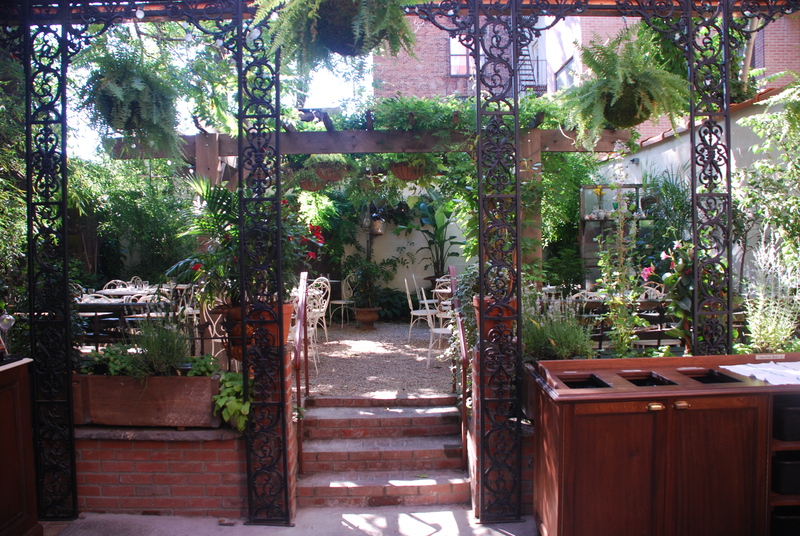 Stakes its claim as the oldest Italian restaurant in Brooklyn. Threes Brewing: A brewery and beer hall that brews its offerings onsite. 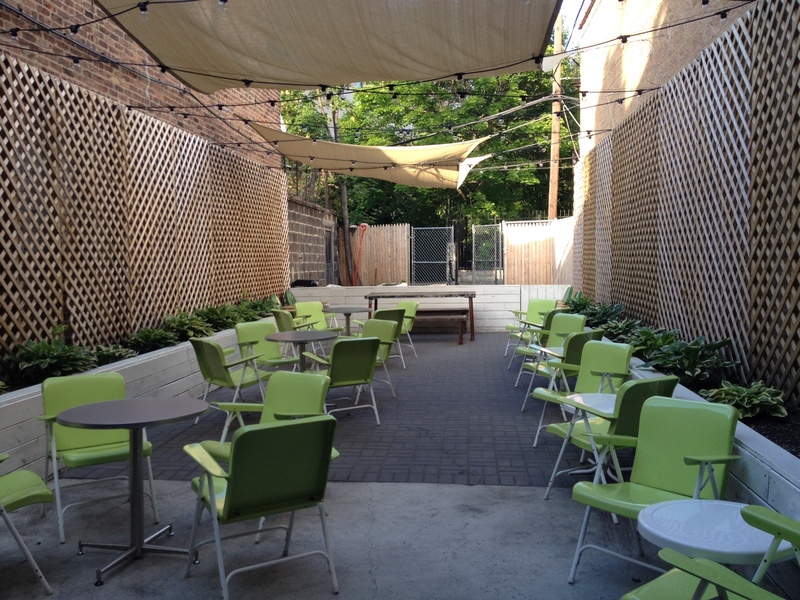 An expansive dining room and event space is packed with locals on weekends. A rotating cast of Brooklyn restaurants like Roberta’s serve a small menu alongside a curated beer list. 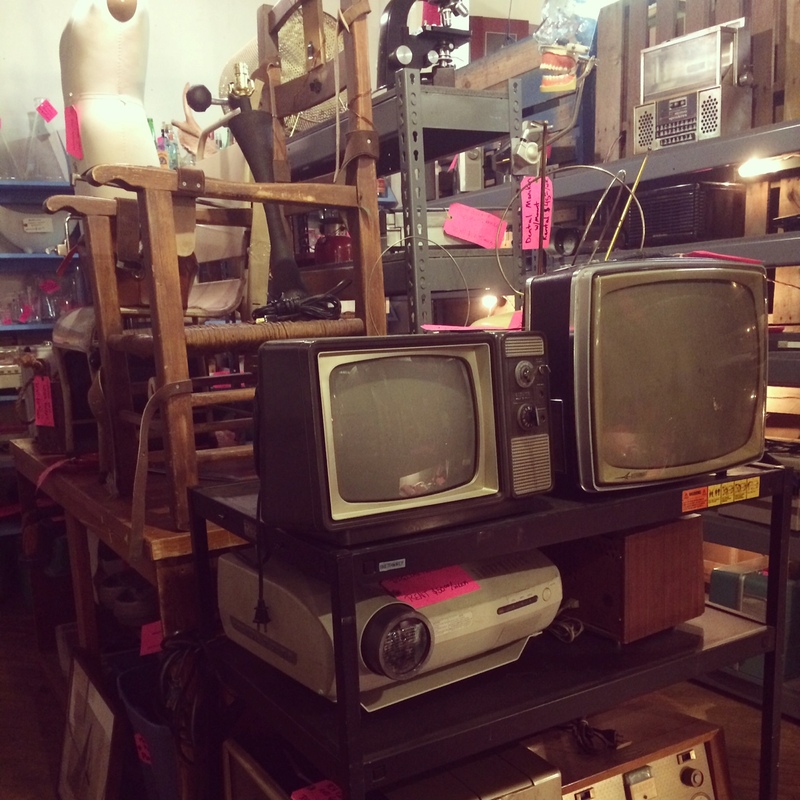 Film Biz Recycling: A warehouse full of quirky film industry prop and set design remnants. Some are available to buy, while stranger items, like gurneys, can be rented by the week. Sixty percent of the materials this non-profit receives are donated to local charities. School of Rock: Learn to play a musical instrument or hit that high note at this one-stop music learning shop. The Bell House: A live music and events venue with a crowded calendar. 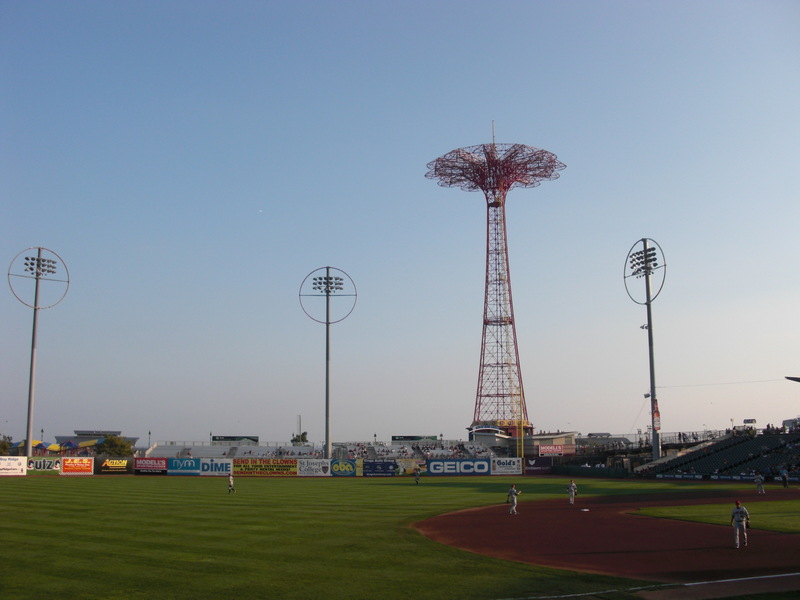 See bands like Crooked Fingers, attend a Little Mermaid sing-along, Brooklyn comedian Eugene Mirman’s Comedy Festival or a Pat Kiernan-hosted trivia night. Whole Foods: A real sign of changing times, this 56,000 square foot Whole Foods features a greenhouse, a rooftop bar and a manicured canal-side walkway. Morbid Anatomy Museum: a gift shop, library, exhibition space and lecture series exploring macabre fascinations. 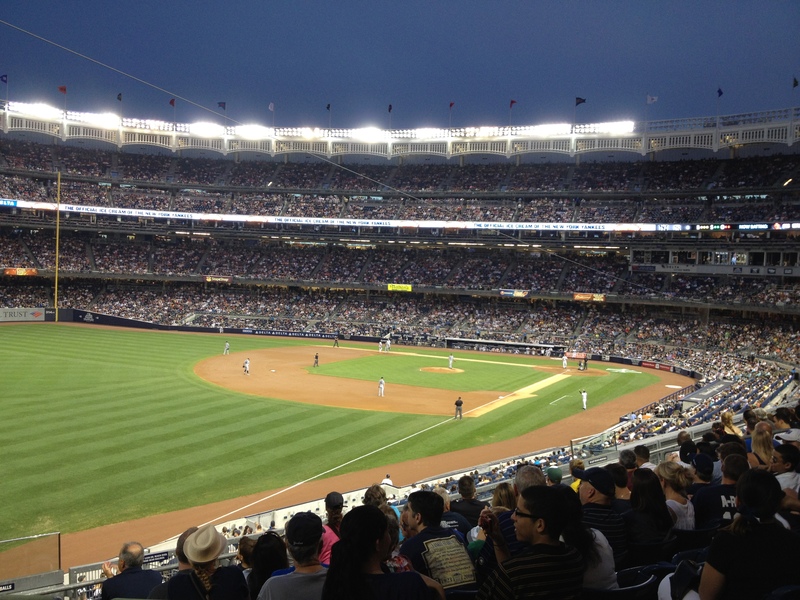 New York City is rich with ethnic enclaves. This means culture-specific restaurants, bookstores, and perhaps most excitingly, food markets. If you’re not well versed in that specific culture, stepping inside can be a tad intimidating and overwhelming. Where to start? How do you make sure you’re picking up the right products? 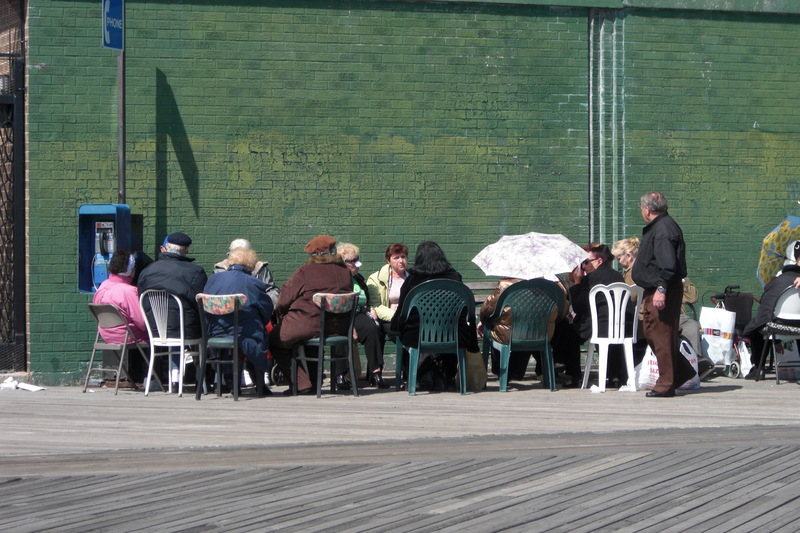 As a Russian immigrant, I often go to Brooklyn’s beachside Brighton Beach neighborhood to fill up on provisions. One of my favorite grocery stores is Brighton Bazaar. It’s clean, expansive and easy to navigate. Here are some of the things I like to pick up when I make a trip. 1. Pickled things are the antipasti of Russian meals. 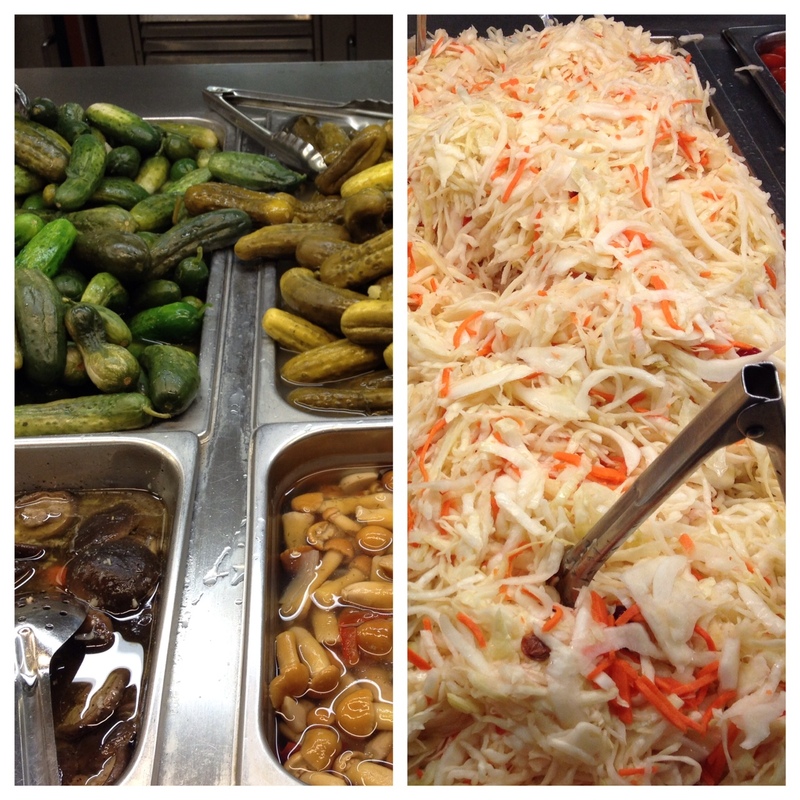 The cabbage is tart and refreshing as are the full sour and half-sour pickles. You can also pick up pickled mushrooms, tomatoes and even watermelon. 2. 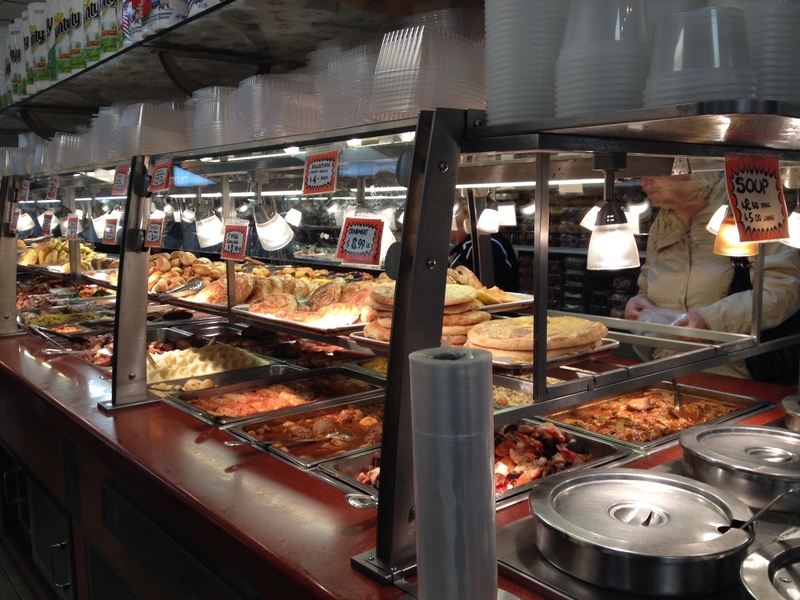 The hot bar is a cornucopia of Russian specialties, from bread pockets to meat cutlets to mayonnaise-y salads. The meaty, fatty, flavorful borscht is hearty enough for a full meal. 3. The aroma emanating from the sliced meats counter reminds me of the sliced bologna and salami we indulge in during family gatherings. 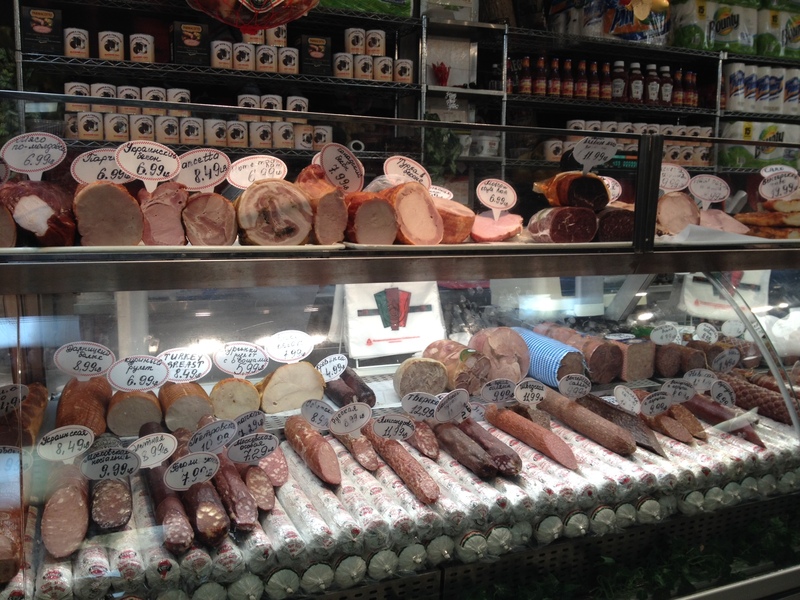 For salami, I’d suggest one of the more expensive varieties, like Hungarian (Vengerskaya) or Tzar’s (Tzarskaya), or, if you don’t eat pork, an all-beef salami referred to as “Jewish” (Evreyskaya). I have a soft spot for the alarmingly cheap Doctor’s pork bologna (Doctorskaya), which is smooth and strangely refreshing. My husband insists my love for it is a product of misplaced nostalgia, but I would still recommend it for the Russian food novice–it has a universally appealing taste that’s much less gritty than the Oscar Meyer variety. 4. Apparently this shop’s bakery department orders their breads all the way from Germany. 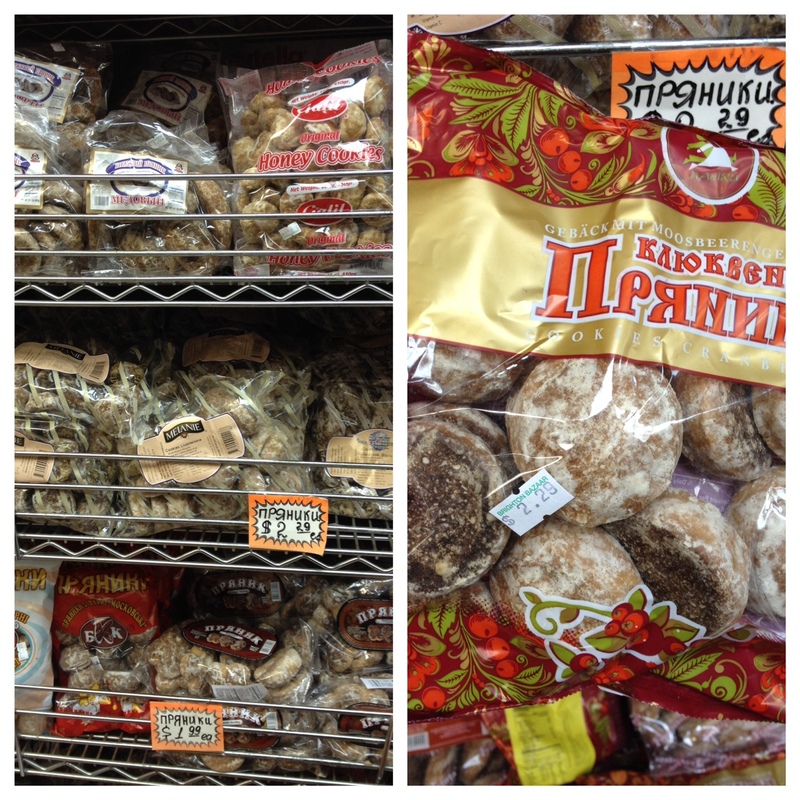 It makes sense; German bread is renowned in Russia, and the varieties offered here are top-notch. 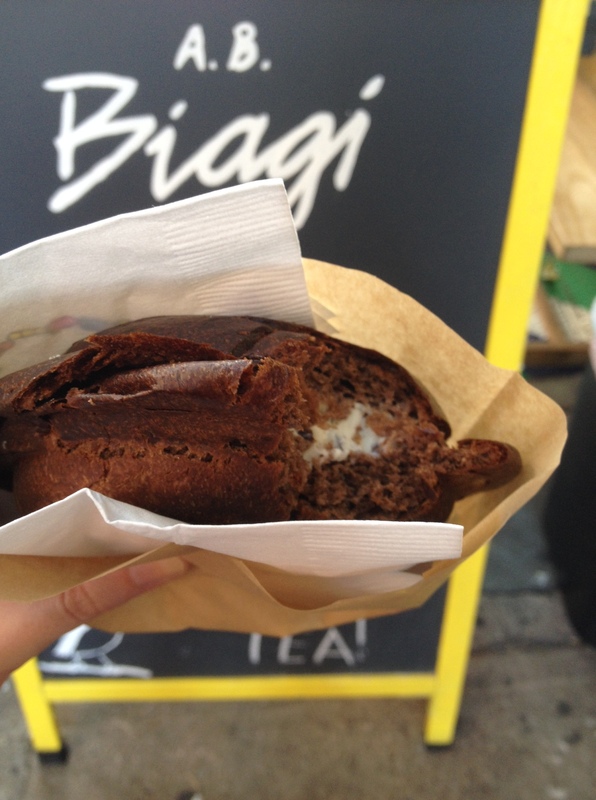 The darker breads are dense, delicious and perfect for sopping up sour-cream drenched things. I usually get the “crusty bread”, which is on the lighter side of dark, and has a nuanced sourdough quality. Feel free to pick up a poppy seed roll–the favorite dessert of every Russian father–if you’re looking for something sweet. 5. 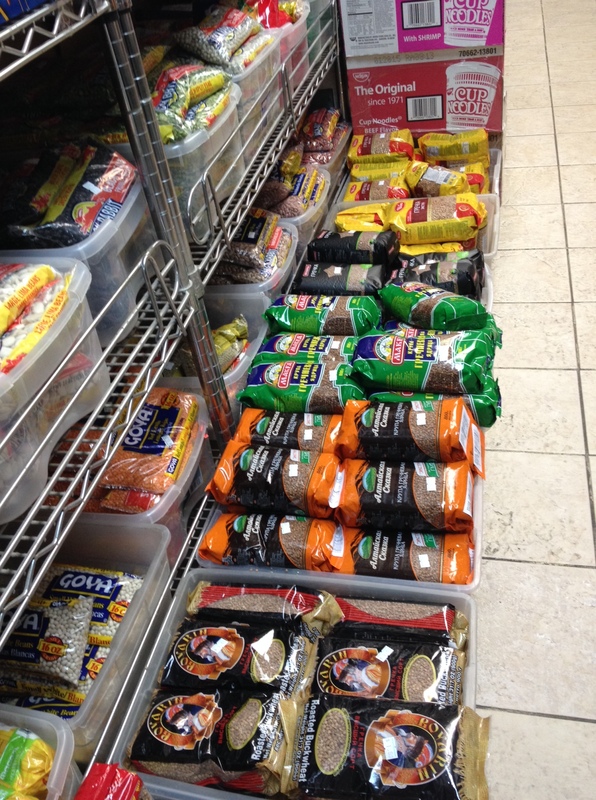 There are a few varieties of dried fish in the seafood section. The one I’m most familiar is vobla. 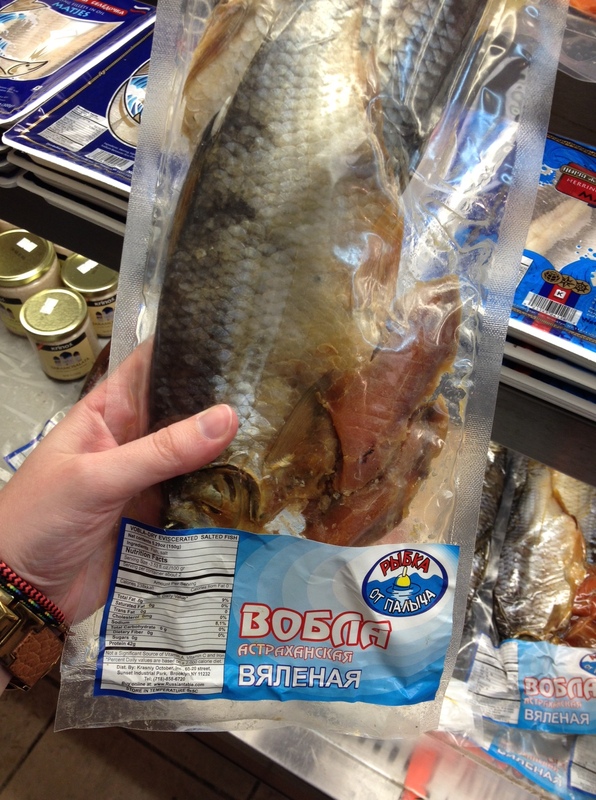 It’s the fish of post-banya meals and lazy afternoons. It requires a a bit of softening, so you can either hit it against the table a few times or bend it back-and-forth until it’s pliable enough to pick at. It’s salty, so pair it with a refreshing beer–a Baltika, maybe?–for a truly Russian experience. 6. Buckwheat kasha or grechnivaya kasha (on the floor) is to Russia what French fries are to the United States. It’s a a staple side in nearly every home and restaurant. It’s not only a side, though. Add some sauteed mushrooms for a complete meal. 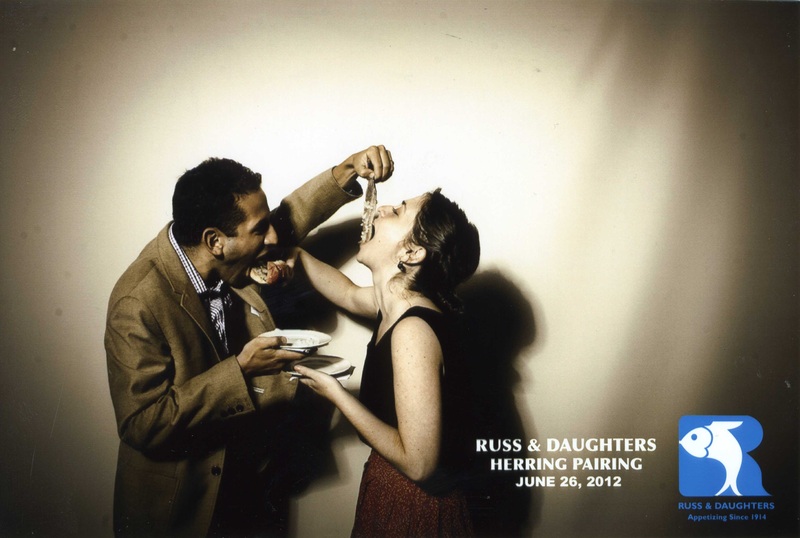 My favorite dish as a child was buckwheat kasha mixed with cutup hotdogs. 7. 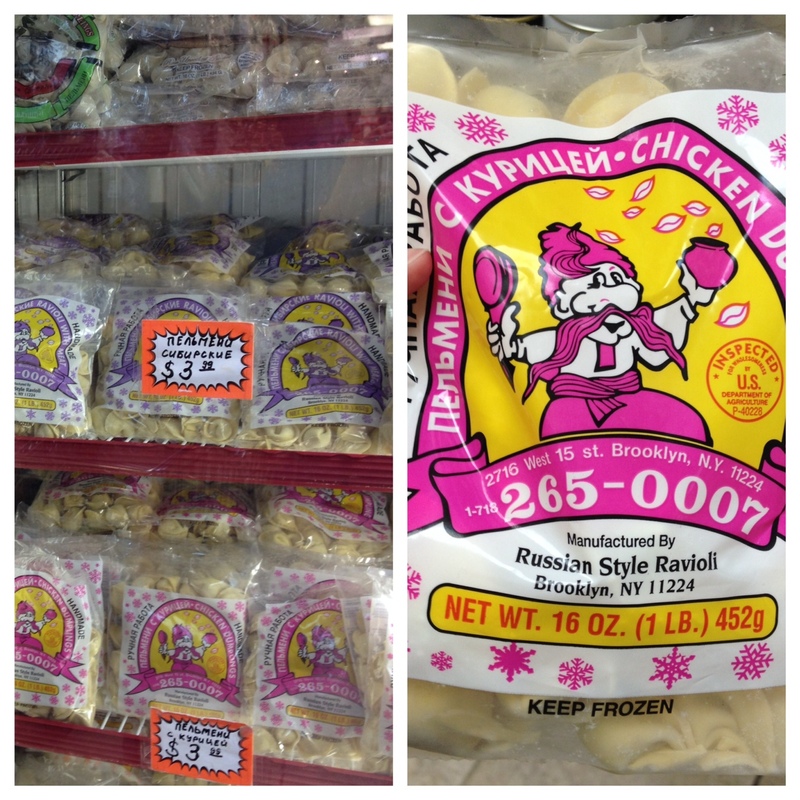 Russian-style dumplings or pelmeni are my go-to frozen entree when I don’t have time to cook. There are over a dozen varieties to choose from, including sweet versions with cherries, often referred to by their Ukranian name, vareniki. I usually go for the chicken dumplings, but the most popular are “Siberian”-style, a mixture of beef and pork. Boil until tender and top with a spoonful of sour cream or melted butter. 8. When I was younger, one of my favorite items from the Russian food store was a bag of pryaniki, Russian gingerbread honey cookies. 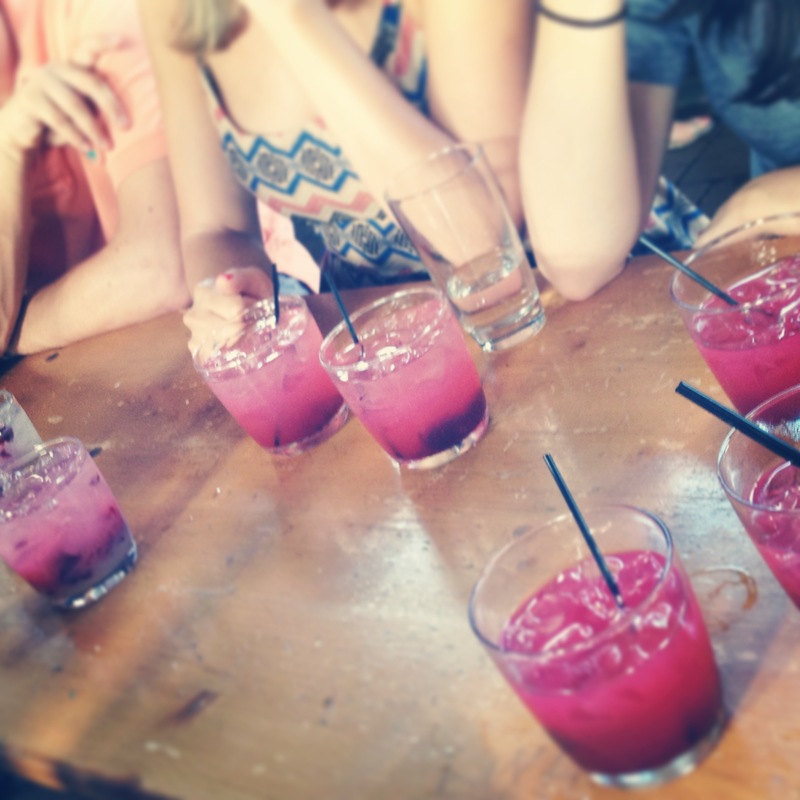 There is an abundance of choice when it comes to picking your favorite. Do you like them smaller or larger, with a more pronounced gingerbread flavor or a more pronounced honey flavor, with more sugar glaze or less? They’re delicious, but also a bit of an acquired taste. They tend to be slightly drier than American-style gingerbread cookies and may require a dunk into tea or coffee. 9. There’s no American food product my parents hate more than factory-made marshmallows. They’re convinced American marshmallows taste of chemicals, and well, they’re kind of right. 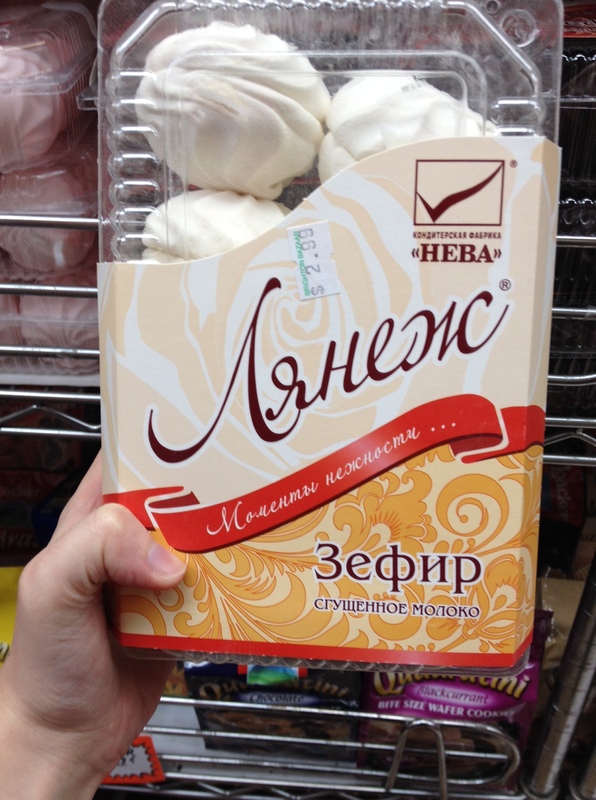 On the other hand, they love zephyr, a Russian dessert with a similar texture. It’s made with fruit puree, sugar, egg whites and some type of gelling agent. It’s airy, pliant, sweet and even better when covered in chocolate. 10. 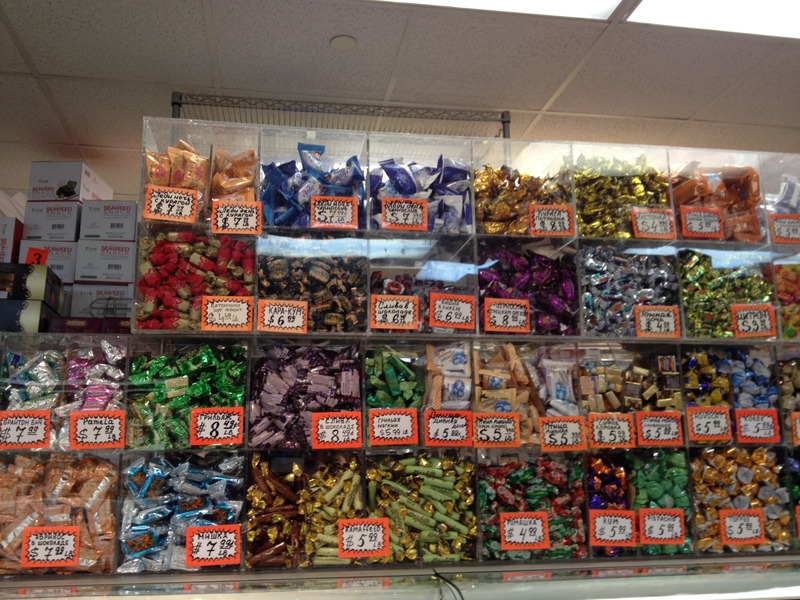 Let’s get one thing out of the way: Russian chocolates look better than they taste. And well, that’s okay, because they still taste pretty good. The packaging is the star, though, especially in the case of the awesomely retro paper-covered chocolates. All feature bright Soviet-era illustrations, some inspired by Soviet realism, others by 70s-era children’s books. They’re mostly chocolate-covered and the interior is usually a wafer or a nutty nougat filling. 11. Russians tend to prefer their desserts less overwhelmingly sweet than many Americans. They love flaky, buttery, Napoleon-style French pastry, and go ga-ga for layered meringue cakes, like the crazy-popular Kiev cake. The oblong, walnut-looking sandwich cookies (below, middle) called oreshki (the Russian diminutive word for “nuts”) are a wedding staple, made from a mayonnaise batter and filled with caramel cream and crushed nuts. The long, purple, candle-looking dessert is called churchkhela and is popular in the Caucuses. The long spokes are made from nuts which are repeatedly covered in a gelling fruit juice mixture and left to harden. Now that it’s finally beginning to feel like spring outside (knock on wood, spit thrice over your left shoulder, pray to the god of your choosing), it’s time to let your hair down and once again set out on foot across this great city. 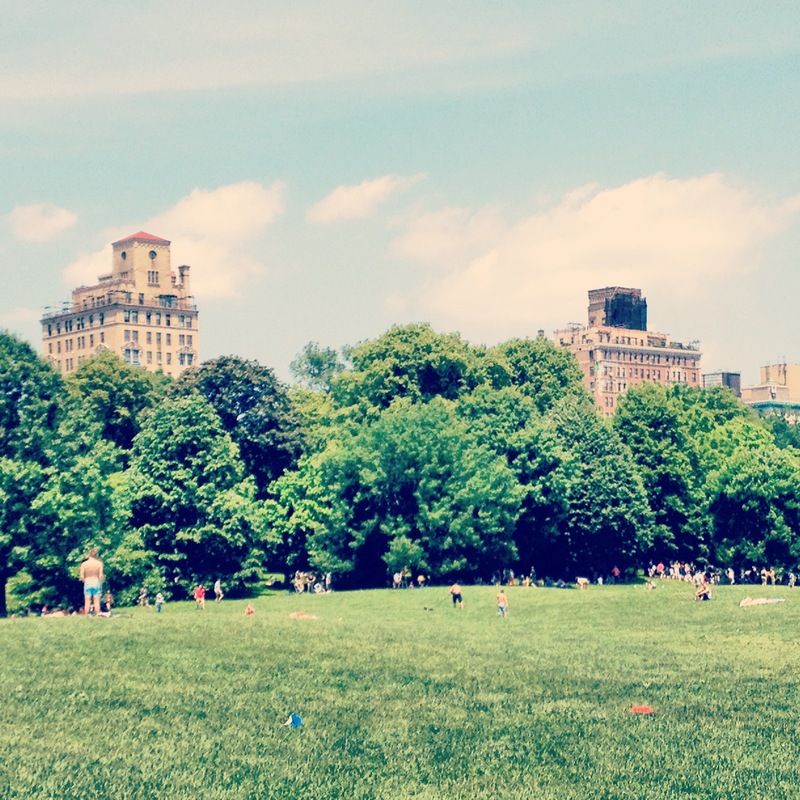 What better place to start than the Upper East Side? Yes, that Upper East Side. While we weren’t looking the buttoned-up ‘hood has transformed, with the help of a few longtime standouts, into the greatest dessert destination in NYC. 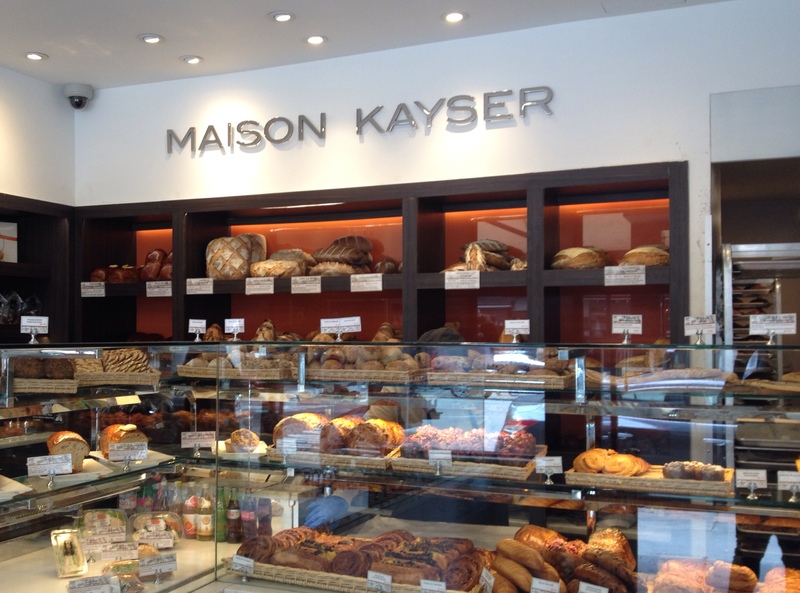 Maison Kayser: The flagship NYC location of a Parisian-based patisserie, this shop is known for breads and pastry and a healthy collection of American treats like cookies and brownies. A sit-down restaurant is filled with ladies-who-lunch enjoying open faced sandwiches and salads. If you’re sitting down to lunch or dessert, make sure to ask for a bread basket filled with an assortment of bread samples; they won’t bring it to you otherwise. FB Patisserie: The fancy older sister to Francois Payard’s downtown bakeries, this location specializes in mousse-based pastry, tarts and French macarons. 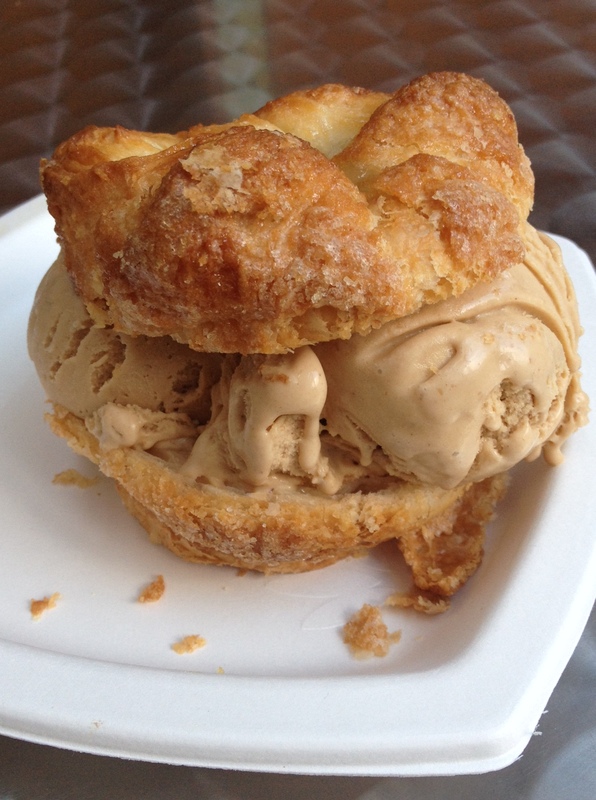 It’s a best-of compilation of French pastry. In front, there’s a casual cafe perfect for enjoying an eclair and a coffee, while the back is host to an upscale full service restaurant–with prices to match. 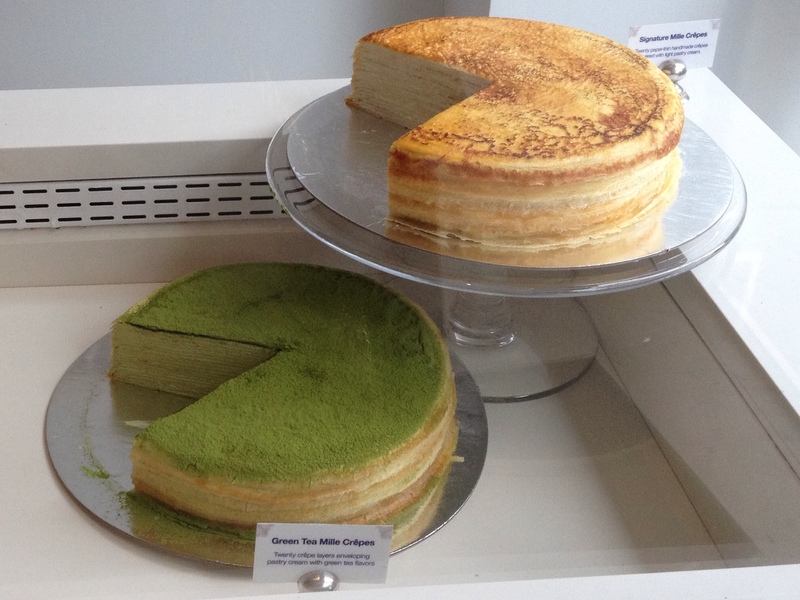 Lady M Confections: This slim minimalist shop is home to one of my favorite cakes ever, the original mille crêpe cake, shown below at right. It’s not cheap ($7.50 a slice), but with 20 paper-thin crêpes and light, not-too-sweet cream layers, it’s an ideal celebratory indulgence. There are other flavors and other cakes, but the original is the superstar. The guidebook writers seem to think so, too, as the shop was packed with tourists during a recent visit. 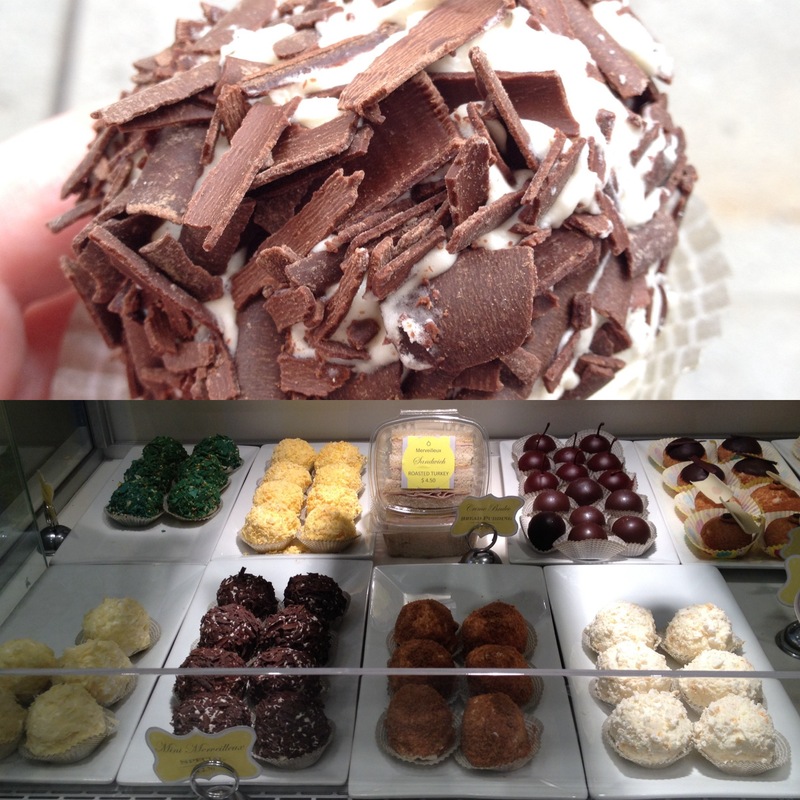 William Greenberg Desserts: This shop has been an Upper East Side institution for nearly 60 years. Their famous black-and-white cookies are made in the traditional way (more spongey cake than cookie, fondant icing) and are customizable when ordered in large quantities. They also specialize in Jewish desserts, which for the next two weeks or so means kosher-for-Passover favorites like chocolate-covered matzoh and flour-less brownies. 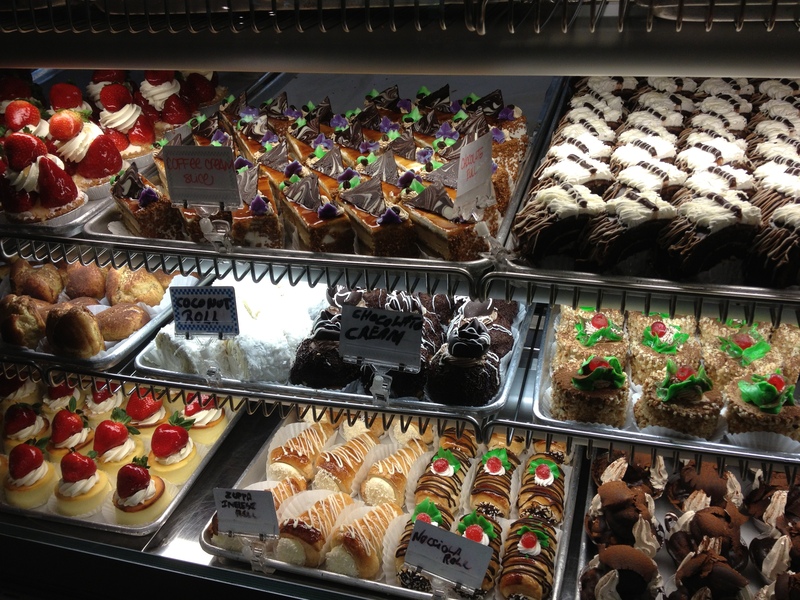 Glaser’s Bake Shop: Open for over 100 years, this no-frills shop harkens back to the Upper East Side of yesteryear, back when Yorkville (the name of the eastern section of the neighborhood) was filled with central European immigrants. The influence is evident in their large selection of Danish pastries, but the bakery also specialize in American favorites like cupcakes, brownies, pies and layer cakes. 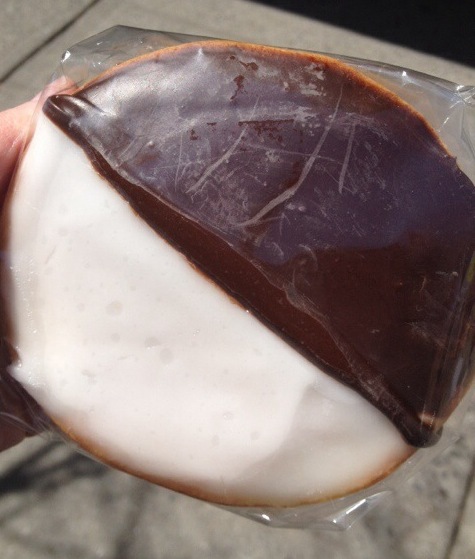 The customer favorite is the black-and-white cookie, which, in contrast to William Greenberg’s they top with fondant and buttercream frosting. 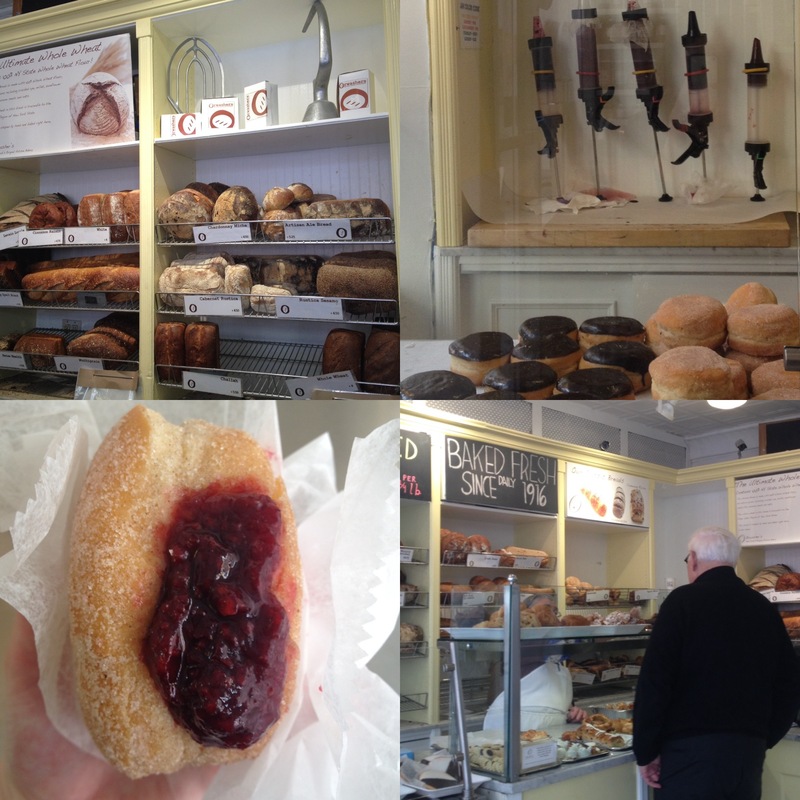 Orwashers: Our tour of the historic bakeries of the Upper East Side continues, and this one’s a real gem. Orwashers–opened in 1916– churns out award-winning artisan breads; their French baguette was recently declared the best in NYC by Serious Eats. 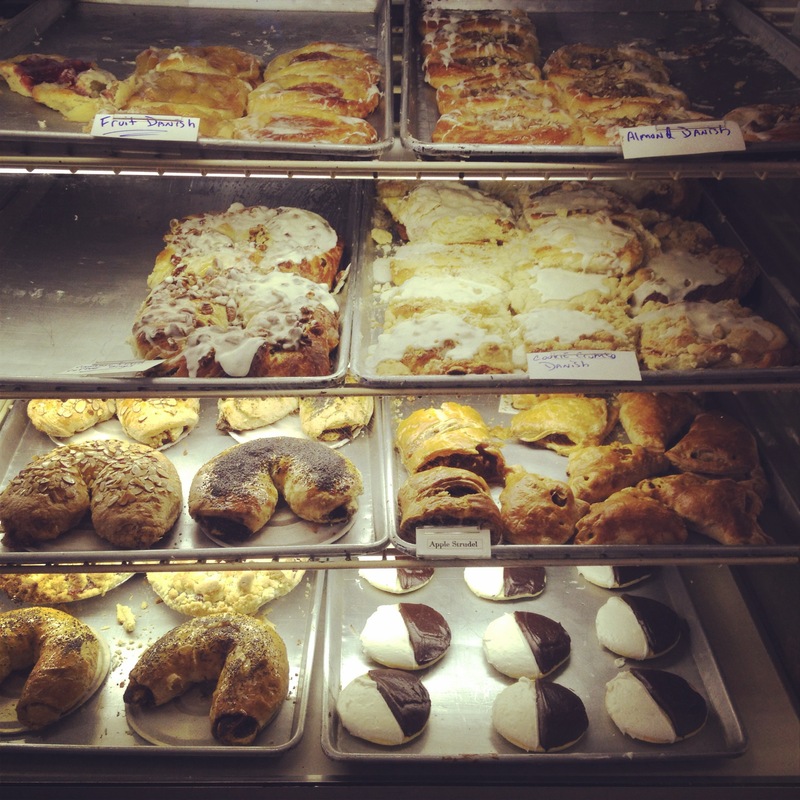 They have pastries, too, as well as filled-to-order doughnuts (chocolate or sugar) with your choice of one of 5 fillings. 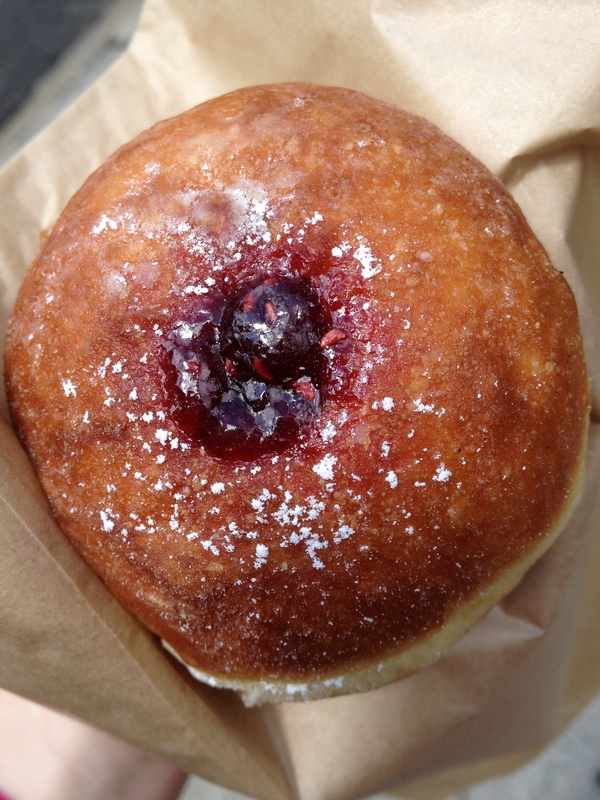 The red raspberry ($4.25) was everything a jelly doughnut should be. Two Little Red Hens: This all-American bakery is extremely popular with the locals, even now, when it’s situated on the wrong side of Second Avenue subway construction. On a recent visit, the shop was out of a lot, and patrons were crowding in to enjoy oversize buttercream-topped cupcakes. The Brooklyn blackout cake is a favorite for birthdays. 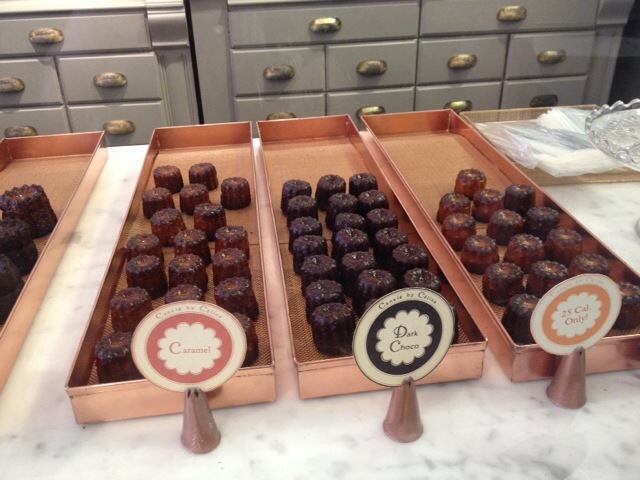 Canelé by Céline: This tiny adorable bakery specializes in mainly one thing–canelés. These ridged French pastries are marked by a soft, custardy center and a browned caramelized exterior. The shop sells unique flavors like caramel, dark chocolate, raspberry and rum, and even a few varieties of a savory canelés, with chorizo or parmesan cheese. It’ll set you back $4.90 for a pack of three. Ladureé: It’s hard to overstate the importance of Ladureé in the Parisian collective consciousness. The mint-green bag is ubiquitous around the city, and Charles de Gaulle airport even has an outpost of the famous shop. The speciality here is French macarons in a rainbow of flavors. 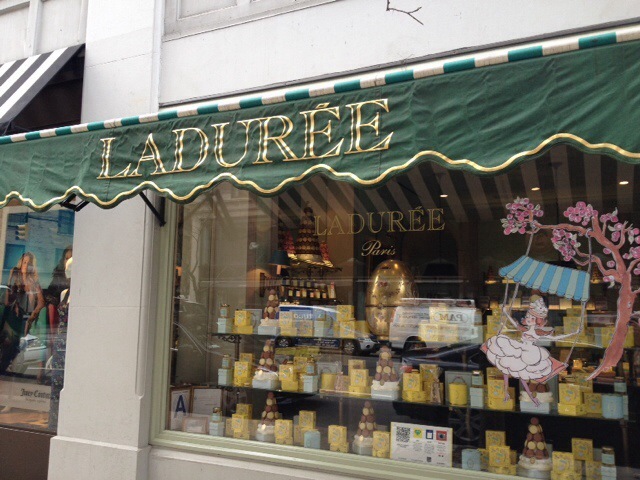 The Upper East Side location is the first in the U.S. (one recently opened in Soho as well) and the macarons are just as good as the ones overseas–light meringue, flavorful filling. Their raspberry macaron ($2.80 a piece) is the macaron by which I judge all others. 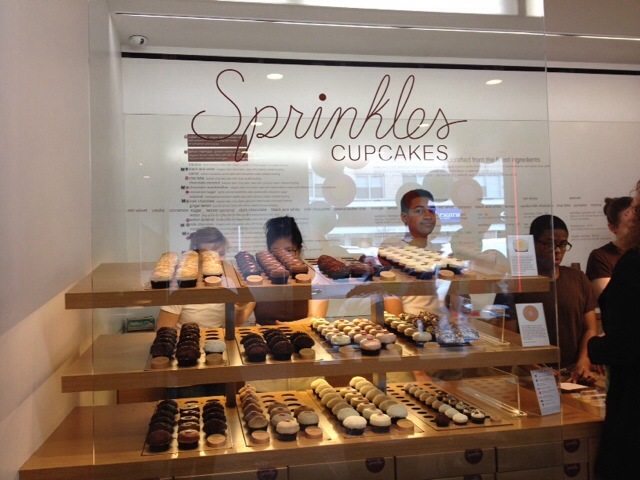 Sprinkles Cupcakes: This L.A. transplant is all about the cupcakes ($3.75 a piece). Yes, the cake is moist and the frosting is flavorful, but I think what people are drawn to most is the minimalist design of the shop, something mostly absent from American throwback-style bakeries. Next door is a 24-hour cupcake ATM, which is exactly what it sounds like. You pick your cupcake from a touchscreen, swipe your card, and within seconds, a little door opens with your cupcake of choice enclosed in a to-go box (add $.50 for the convenience). Is it at all necessary? Absolutely not. But it sure is cool. Dough Loco: There’s some debate about whether this shop’s location, on Park Ave. and 97th St., constitutes the Upper East Side or East Harlem. We’re not concerned with realtor definitions, just with dessert. 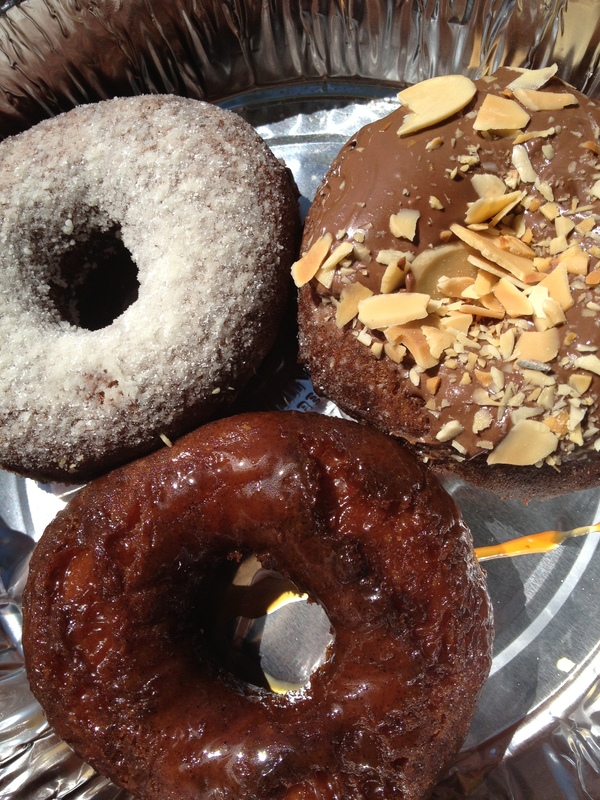 The doughnuts ($3 a piece) remind me a lot of the ones from Dough in Bed-Stuy. Both shops feature yeast doughnuts topped with unique coatings. The ones here are smaller, though more dense. 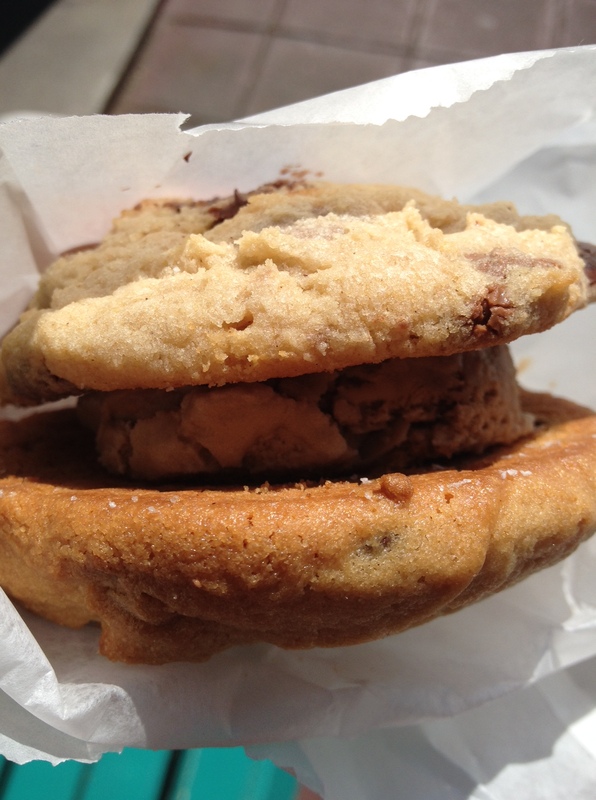 Flavors include maple miso, blood orange, raspberry Sriracha, and the below, peanut butter and cassis. Blue Bottle coffee products help you wash them down. 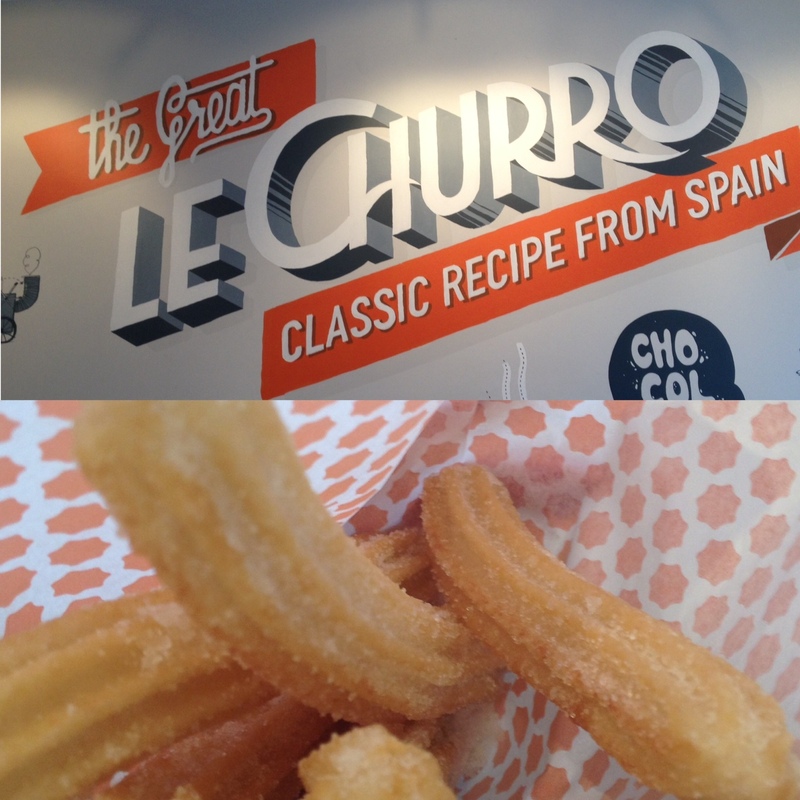 Le Churro: I have a soft spot for churros. After all, what’s not to love? 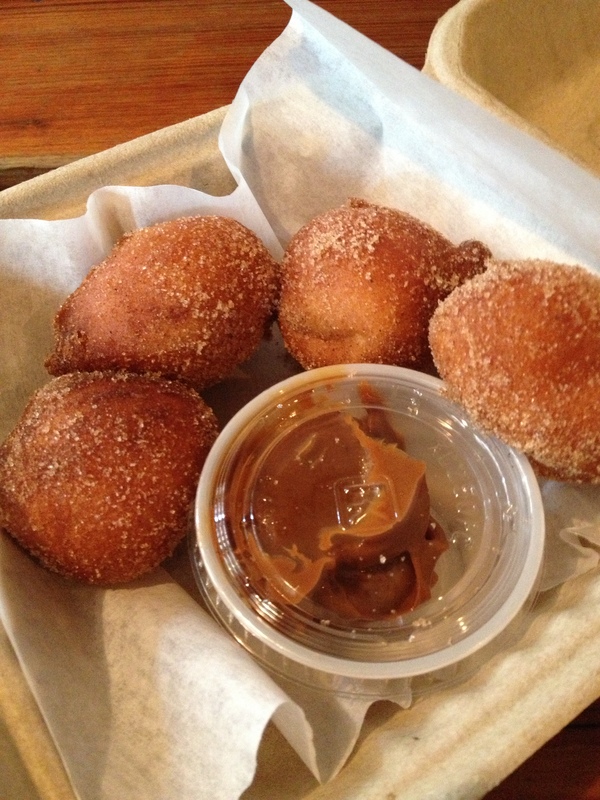 Freshly fried dough drenched in sugar and served with a chocolate dipping sauce. 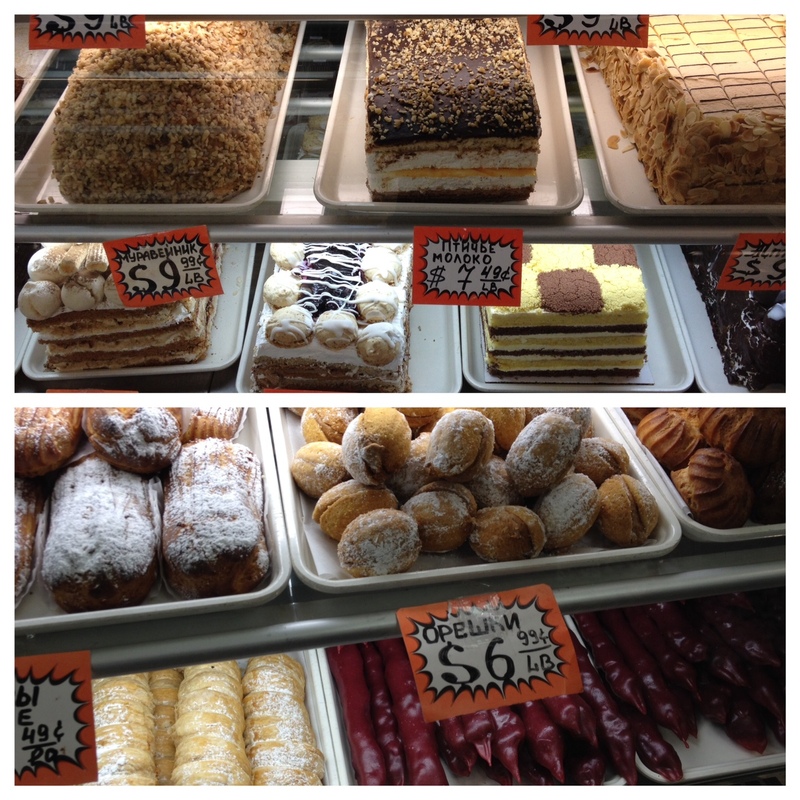 The ones here (4 for $3.95) are thin and light, in contrast to the heavy churros of the subway platform and Costco cafe (hey, if you’re in a bind…). They offer multiple dipping sauces (chocolate hazelnut, sweet mocha, to name a few), chocolate covered churros, bite-sized churros and even filled churros, for those too lazy to dip. Ô Merveilleux Belgian Meringue: I had never heard of Belgian meringues before, but they’re the specialty at this quaint new Second Avenue shop. These treats, which come in two sizes, layer meringue and whipped cream and are topped with chocolate shavings or speculoos cookie crumbs. The small, at $2.70, is plenty sweet to satisfy a serious dessert craving. 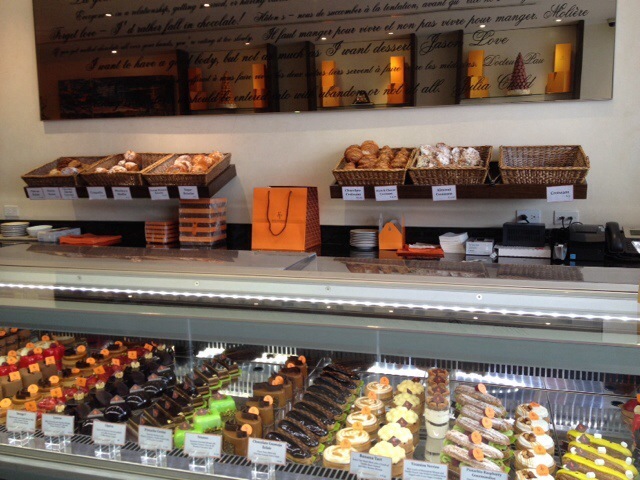 They have other offerings too, including cupcakes, croissants, cakes, cookies, brioche and tarts. Fall is when New York City really shines. The tourists have gone home; a comfortable crispness has returned to the mornings; plays, dance performances, author readings and other cultural events abound. It’s also a great time to explore the charm of nearby small towns and destinations outside the city limits and to actually catch a glimpse of those changing trees. Below a short, easy-to-manage list of things that make the season. There’s a very expensive, destination-worthy restaurant at this sustainable farm in Pocantico Hills, about 30 minutes north of the Bronx. It’s ideal for weddings, special occasion dinners and the like. If you’re not in the mood to drop half-a-month’s rent on dinner, there’s also a café stocked with fresh salads and delectable pastries. The best parts of Stone Barns, though, are the farm and beautiful grounds. 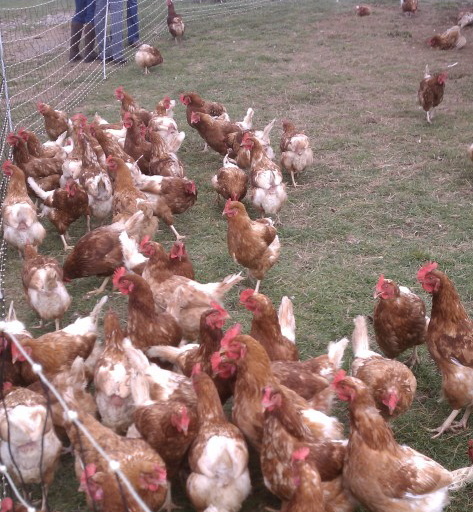 Walk amongst the grazing sheep and trotting chickens. Admire the galloping turkeys as they run toward you in packs. Further back, toward the woods, are the oversized, nearly half-ton Berkshire pigs. They’re really quite adorable…in an ugly sort of way. If you’re a vegetarian or would rather not see your food happily alive (no matter how well treated), stick to the vegetable garden, the greenhouse and the hiking paths snaking around the back of the grounds. They’re covered by canopies of trees in a kaleidoscope of colors. You can’t get more “fall” than that. New Yorkers tend to travel to this low-key Long Island wine growing region in summer, as a way to escape the chaos of the Hamptons. It’s even calmer in the fall, when roadside stands turn into pumpkin patches and visitors can enjoy cool evenings with a wine tasting flight, overlooking local vineyards. 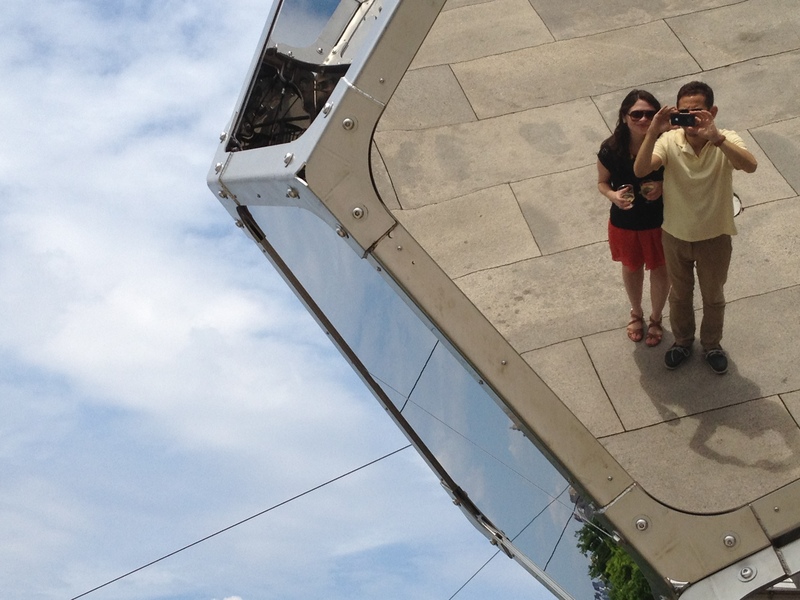 Last year, my friends and I piled into a car and made a day of it. We stopped into the recently relocated North Fork Oyster Company (now dubbed The Square) for a lunch of oysters and seafood and then grabbed a beer tasting (you get to take home the pint glass) at Greenport Harbor Brewing. Alternatively, you can check out the much-loved North Fork Inn lunch truck, behind the North Fork Inn & Table, for salads and sandwiches to-go. We walked around picturesque downtown Greenport and over to the waterfront. From there we made our way to Orient Beach State Park for a breathtaking view of the sound. Then it was on to a sparkling wine tasting on the deck of Sparkling Pointe, surrounding by pretty magic hour light. 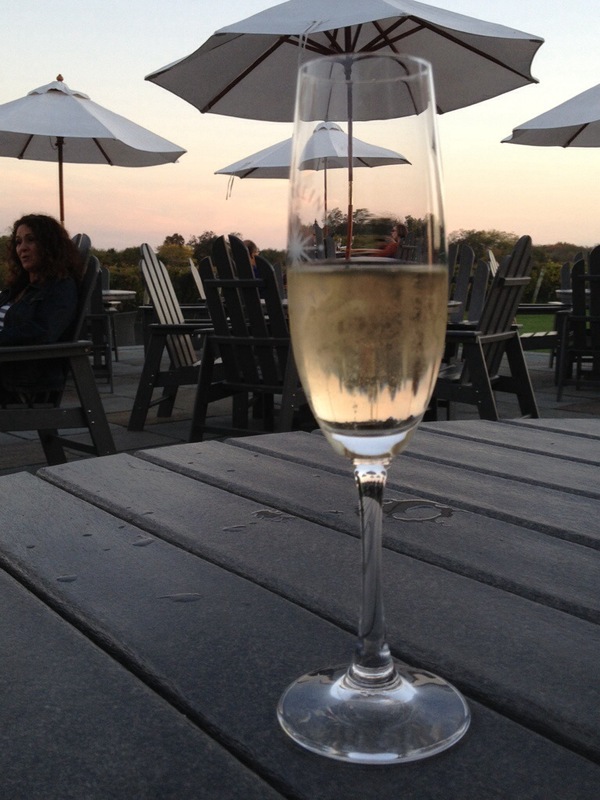 (A list of Long Island wineries can be found here.) 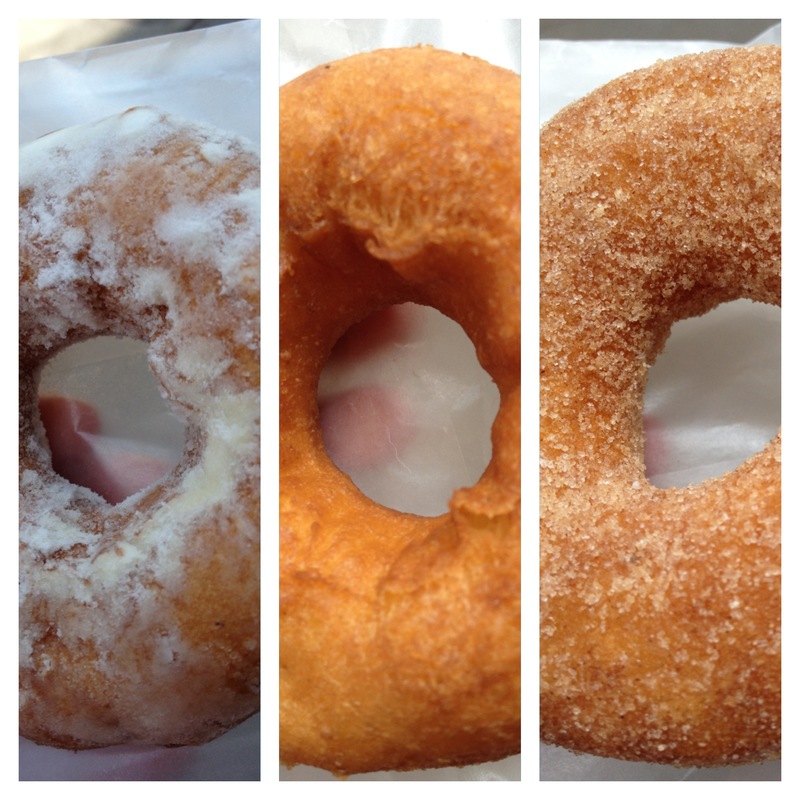 We finished the day in perfect fashion, with apple cider donuts from a local stand. I get a bit obsessed with pumpkin-flavored things in fall. A little too obsessed, sometimes. I once spent the entire month of October seeking out pumpkin-flavored treats in the city, determined to try every one. I don’t suggest you do the same as it’s much too time consuming, but here’s a sampling of treats you may want to, you know, casually come across: pumpkin gelato at Il Laboratrio del Gelato, pumpkin trifle pudding at Sugar Sweet Sunshine, a pumpkin whoopie pie at One Girl Cookies, pumpkin pie custard at Shake Shack, a pumpkin donut (both cake and yeast varieties) at Doughnut Plant. I love the New York City Marathon and not because I’m an avid or even recreational runner. It’s that I love seeing runners from all over the world come to our fair city to complete a life goal. Yes, the elite athletes are impressive, but it’s the stragglers I admire, the ones determined enough to finish a 26.2 mile race against the odds, to prove something about their bodies and themselves. Most marathoners have their countries as well as their names written on their jerseys so you can call out: “You’re looking great, Doug!” and “Nice job, Marianna!” Many smile when they hear their name called. It’s heartwarming and uplifting and just plain fun. Let’s talk doughnuts. One might venture to say they’re the perfect dessert. Pillowy, buttery, sugary and carb-y, doughnuts haven’t met a day they couldn’t make better. They’re as much a part of American culture as Superman and movies about prom (seriously, how many do we need?). New York City has a healthy collection of doughnut-focused purveyors, including standouts Doughnut Plant on the Lower East Side, Dough in Bed-Stuy and Peter Pan Donut & Pastry Shop in Greenpoint. Today, however, we’re focusing on something a little different. 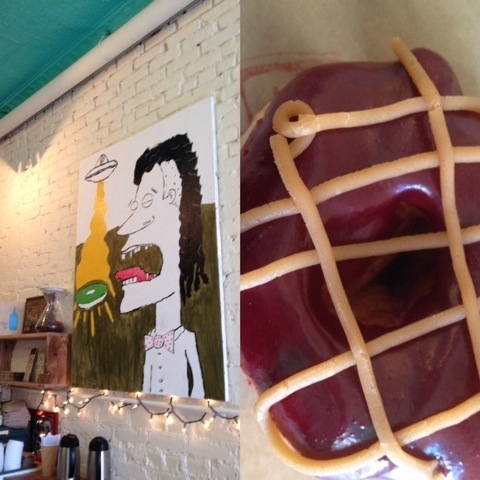 Here are a few places where doughnuts are an unexpected surprise, not the main attraction. Paid for through the generosity of Kickstarter “dough-nators”, this restaurant’s doughnut machine makes small cakey doughnuts, which are sold plain or dusted with either cinnamon-sugar or powdered sugar, three for $4 or a dozen for $15. I think all those who donated should feel vindicated. These doughnuts (available to-go or with your sit-down meal) are wonderful, with an appealing crust and a surprisingly moist interior, escaping the mealiness that sometimes befalls similar style doughnuts. Overall, one of my favorites on the list. This homey East Village restaurant known for its juicy burger and shareable comfort food also churns out fresh doughnuts. I came in at an off-hour and was treated to made-to-order doughnuts in three flavors: powdered sugar, caramel and chocolate hazelnut with sliced almonds (for $1.75 a piece). These doughnuts were so hot the powdered sugar topping had caramelized by the time I opened my to-go container. According to Grub Street, the secret ingredient is mashed potatoes in the batter. They did have a very unique taste–my favorite was the indulgent chocolate hazelnut–though may have spent a few seconds too long in the deep fryer. Okay, so they’re not REALLY doughnuts in the traditional sense. 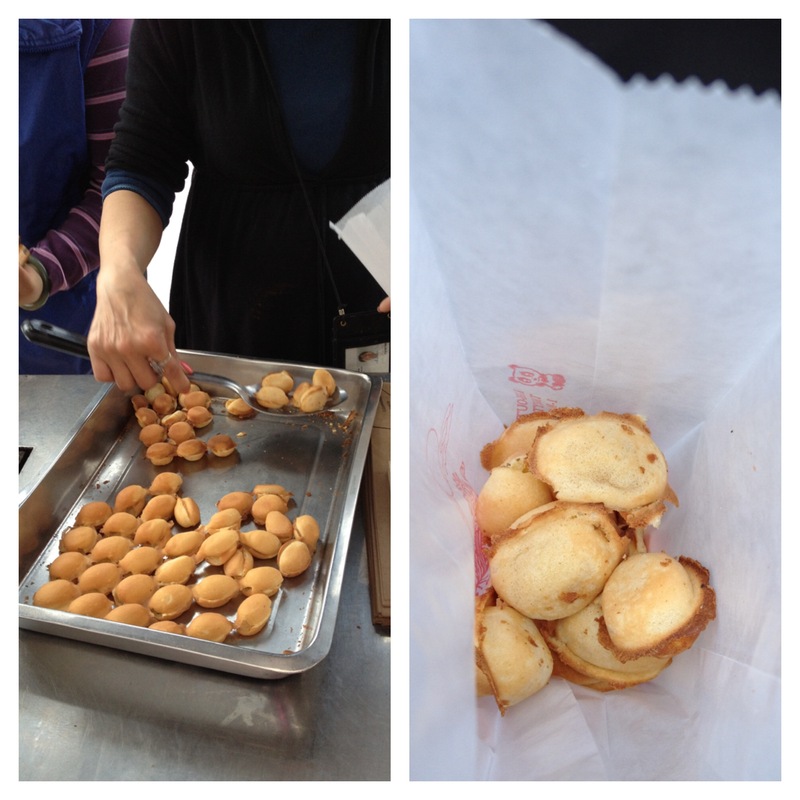 They’re mini cakes, a Hong Kong street food made from a pancake-style batter that is poured into a special griddle (see below). The result is a web of quarter-sized ovals with a crisp exterior and a soft, slightly custardy center. At 15 or 20 for $1, depending on location , they’re hard to pass up. Fresh, made-to-order doughnuts are available everyday starting at 11:30 a.m. at this go-to counter of Dumont Burger in Williamsburg. They can be had in a variety of sugar dustings–cinnamon, lemon or ginger–and, if you get the 9-order,with dulce de leche or chocolate dipping sauces. They have a nicely browned exterior and soft, satisfying, albeit slightly dense innards. Three bites for $4, or nine for $6 isn’t the most amazing deal, but totally worth it for the MTO factor. These filled Italian doughnuts, or bombolini ($3.50 each), at bread whisperer Jim Lahey’s cafe -bakery are the bomb…olini (I’ll show myself out). They have a tremendous amount of flavor in the actual dough–a testament to their quality since yeast doughnuts not fried correctly often taste mainly of grease. The raspberry filling (one of several offered) is tart, sweet and potent, with none of the artificiality of chain-style jelly doughnuts. 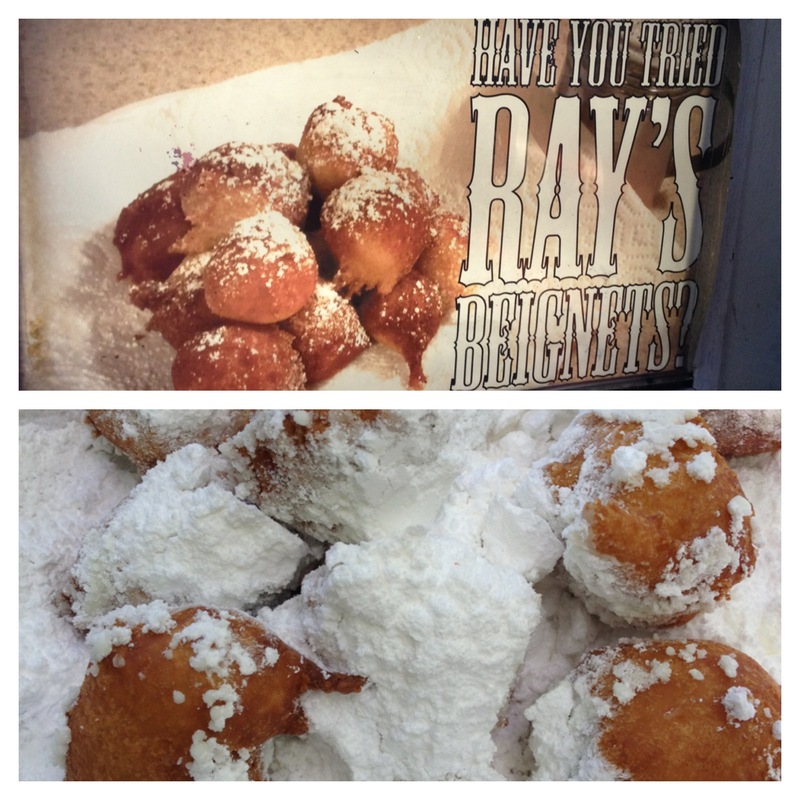 Not only is Ray’s one of the only places in the city to get freshly-made beignets to go, it’s also THE only place to get them at 4 a.m. after a raucous night out in the East Village. Ray’s has been an Alphabet City institution since 1974, and though the surrounding area continues to transform at some-would-say alarming speeds, Ray’s is a time-capsule of a grittier era, when the ‘hood was filled with junkies and artists. These perfectly serviceable beignets come buried under a mountain of powdered sugar. As in, I had to turn a few over in the below photo, so you could tell there were actual doughnuts hiding under those sugar peaks. Six will you set you back $3.50, or if you’re really hunger, you can get 12 for $6.50.